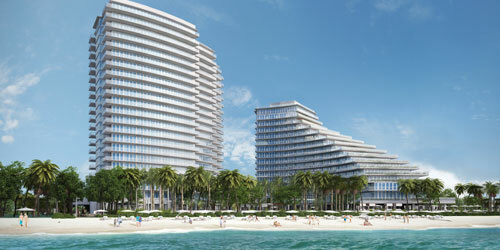 Have you checked out any of the new, ultra-luxury projects for sale now in South Florida? Many of the individual homes or condominium units under development are decked out with some pretty impressive features. But there’s a simple explanation for why more developers are building pricey details into their new-home projects: today’s buyers expect them. Here’s a sampling of some of the ultra-luxury or unique features you can find in new-construction projects now selling in Broward and Palm Beach counties. Expansive terraces. The 68-unit Sabbia Beach in Pompano Beach has four Terrazza models, each a corner residence that features more exterior space than interior space. Created so that residents can enjoy outdoor living at the oceanfront project, the Terrazza models are particularly attractive to buyers who are selling large suburban homes or who want to entertain outdoors. The Terrazza units have 2,201- to 3,900-square-foot terraces, each with a summer kitchen, spa, shower and raised deck offering city and ocean views. Prices for the Terrazza models start at $2 million. Private pools. As if a 3,000-square-foot terrace wasn’t enough, how about a private rooftop pool? Sage Beach, a 24-unit condominium in Hollywood by Property Markets Group, has six penthouses with private rooftop terraces and 10-foot by 20-foot pools; five of those penthouses are sold. The price of the remaining penthouse is $2.2 million. State-of-the-art kitchens. While the 171-unit Auberge Beach Residences & Spa Fort Lauderdale also has private plunge pools in select residences, its kitchens are something special, with top-of-the-line cabinetry, fixtures and appliances. The kitchens in each unit vary in size depending on the particular floor plan, but all come equipped with dark wood Italian cabinetry by ItalKraft, white marble countertops and backsplashes and Sub-Zero and Wolf appliances. Each kitchen also has a built-in espresso and cappuccino maker, as well as a Sub-Zero wine cooler complete with two temperature-controlled storage zones, one each for red and white. $5,000 toilets. Purchase a unit at The Bristol in West Palm Beach, and you can enjoy the epitome of bathroom luxury — the $5,000 Toto Neorest 750H toilet, which features a heated seat, personal cleansing and drying system, an air-purifying system, night light and even a wireless remote. This “intelligent toilet”— really a combination of toilet and bidet — even cleans itself, automatically flushes and has a lid that opens and closes by itself. It’s also coated with zirconium, which helps repel waste. Prices at The Bristol start at $5.3 million. Celebrity design services. Botaniko Weston, Terra’s latest project in Broward County, not only features architectural designs by acclaimed architects Chad Oppenheim and Roney J. Mateu, but also modern interior design schemes by V Starr Interiors, the interior design firm led by tennis great Venus Williams. The 125 single-family homes feature contemporary designs that include walls of glass, natural colors and textures and relaxed surroundings. Bathrooms incorporate natural stone tile and elegant, yet simple, fixtures, while spaces throughout the houses blend seamlessly from inside to out. Now under construction, prices for the five- to seven-bedroom homes at Botaniko Weston start at $1.7 million. Hotel services. Don’t feel like cooking tonight? Not a problem if you live at Hyde Beach House, a combination condominium and condo-hotel project in Hollywood. Just order room service. At Hyde Beach House, residents have access to personal concierge services, including tickets to sporting events and theater performances, restaurant reservations, room service, and housekeeping, cleaning and laundry services. How much farther will developers go to one-up each other to attract demanding well-to-do buyers?